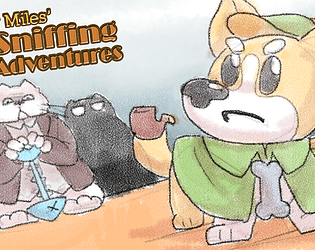 Mr.Miles is on a platform adventure to save other dogs! I love the corgi's animation when it lands from a jump. Adorable game! The controls are a bit wonky, but such an amazing character design! I love the animations. Thank you for the submission. Wow, the animation in this is really really well done and absolutely adorable. It took me a little bit of time to figure out you have to attack the cats from behind but after that it was smooth sailing. I hope we get to see more Mr. Miles Sniffing Adventures in the future!